Heat oven to 425°F. With floured rolling pin, roll pastry into round 2 inches larger than upside-down 9-inch glass pie plate. Fold pastry into fourths; place in pie plate. Unfold and ease into plate, pressing firmly against bottom and side. Trim overhanging edge of pastry 1 inch from rim of pie plate. Fold and roll pastry under, even with plate; flute as desired. In medium bowl, beat eggs slightly. Stir in all remaining filling ingredients. 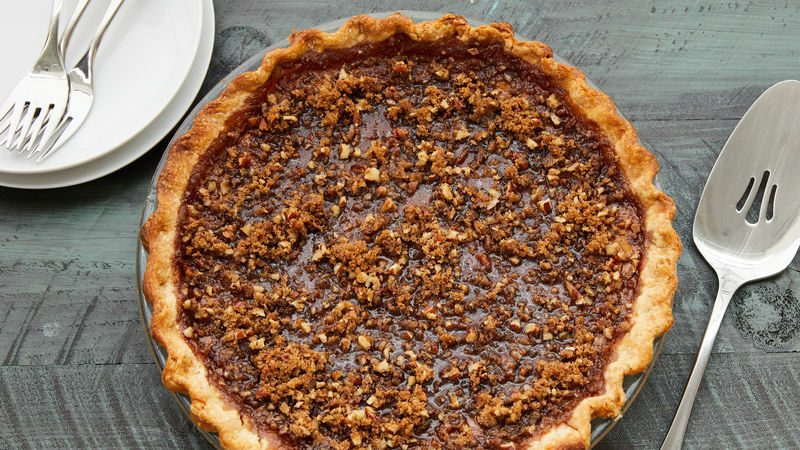 Pour into pastry-lined pie plate. Bake 15 minutes. Meanwhile, in small bowl, mix all streusel ingredients until crumbly. Reduce oven temperature to 350°F. Bake pie 35 minutes longer. Sprinkle streusel over pie. Bake about 10 minutes or until knife inserted in center comes out clean. Cover and refrigerate at least 4 hours. Store in refrigerator. Use evaporated fat-free milk and egg substitutes to slash the fat content. Afraid you'll jiggle the pie on the way to the oven? Place the pastry-lined pie plate on oven rack first; then pour filling into pie plate.